More than one million men and women have served under the UN flag since 1948. UN Peacekeepers can be military, police and civilians. Tragically, more than 3,500 have lost their lives in the cause of peace. UN peacekeepers come from all walks of life, with diverse cultural backgrounds and from an ever-growing number of Member States.When they serve under the United Nations they are united by a commitment to maintain or restore world peace and security. They share a common purpose to protect the most vulnerable and provide support to countries in transition from conflict to peace. Peacekeepers are civilian, military and police personnel all working together. The roles and responsibilities of peacekeepers are evolving as peacekeeping mandates become more complex and multidimensional. Peacekeeping operations have developed from simply monitoring ceasefires to protecting civilians, disarming ex-combatants, protecting human rights, promoting the rule of law, supporting free and fair elections, minimizing the risk of land-mines and much more. Tragically over 3,500 peacekeepers have lost their lives in the cause of peace. In 2016 alone 117 peacekeepers paid the ultimate price. They included military, police, international civil servants, UN Volunteers and national staff from 43 countries. Their sacrifice on behalf of the international community are one of the most concrete expressions of the UN Charter’s determination “to save succeeding generations from the scourge of war.” You can find about the nationality and the missions they served in the fatalities data section. While women have always had a role in peacekeeping, the Secretary-General has committed to ensuring that women play a far more active role in peace operations. Secretary-General António Guterres is committed to building the number of women peacekeepers. As stated in his 2017 Gender Parity Strategy, “Peacekeeping is the most visible face of the United Nations…The fact that only 3% of UN peacekeepers and 10% of police are women hampers our protection reach and operational effectiveness and sends the wrong message about who the UN serves and represents”. A top priority for UN Peacekeeping is to increase the number of female military personnel in peacekeeping operations, including increasing women staff officers and military observers to 15 per cent by the end of 2018; currently 11 per cent of staff officers and military observers in peacekeeping operations are female. At UN Headquarters,18 per cent of military staff are women, exceeding the target of 15 per cent for 2018. Women peacekeepers service in all peacekeeping capacities, civilian, military and police. It is an operational imperative that we recruit and retain women peacekeepers. In addition, women peacekeepers act as role models in the local environment, inspiring women and girls in often male-dominated societies to push for their own rights and for participation in peace processes. 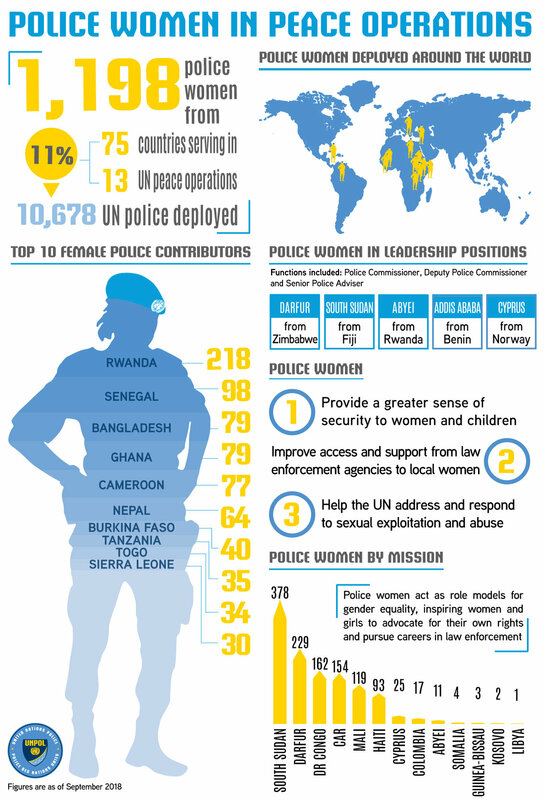 See the many ways women are involved in peacekeeping. Each year on the 29 May we celebrate the International Day of United Nations Peacekeepers. 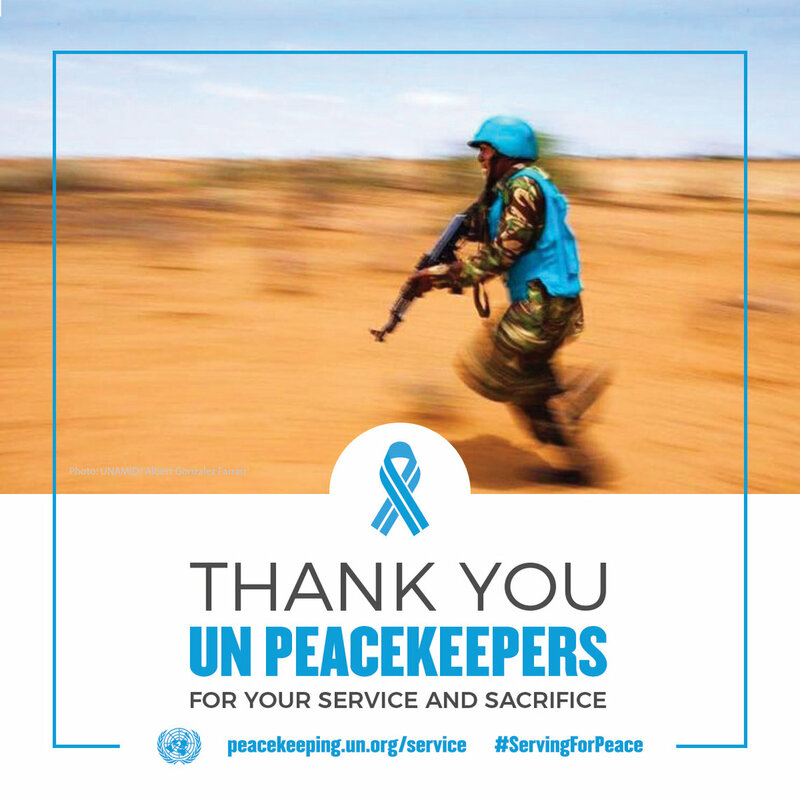 The day was established to honour the memory of the UN peacekeepers who have lost their lives in the cause of peace; and to pay tribute to all the men and women who have served and continue to serve in UN peacekeeping operations for their high level of professionalism, dedication and courage. UN peacekeeping is a unique and dynamic instrument to help countries torn by conflict transition to lasting peace. Peacekeeping is an investment in global peace, security, and prosperity. More than one million women and men have served under the ‘blue flag’ with pride, distinction and courage. Reflecting on the past, present and future of UN Peacekeeping, reaffirming our commitment to working 'Together for Peace'. Focusing on how UN Peacekeeping is evolving to meet new challenges. Exploring the changing needs of international peace and security. Highlighting the variety of partnerships we have at every stage of our work. Focusing on our efforts to strengthen rule of law. Remembering the earthquake in Haiti that resulted in the death of 102 UN personnel, including 97 peacekeepers. The important role of women peacekeepers. The UN expects that all peacekeeping personnel adhere to the highest standards of behaviour and conduct themselves in a professional and disciplined manner at all times. Special training is required to ensure that UN personnel are equipped with the knowledge, skills, and attitudes required to perform these diverse duties and to be prepared for particularly challenging situations. There are several types of required training from pre-deployment which covers basic UN principles, guidelines and policies to more targeted trainings related to specific issues such as sexual abuse and exploitation. These required trainings set standards for UN peacekeeping and guide personnel as they carry out critical tasks to assist the countries within which they work.